Sunrise Fluid Power Inc. has been manufacturing hydraulic products and equipment for more than 28 years. 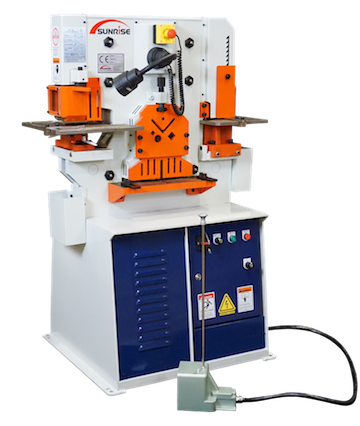 Introduced in 2004 the K-Series is a specially designed ironworker with vertical movement on all stations. The entire main slide moves in an up and down motion to provide optimum results for punching, shearing, notching and bending without other moving parts. Hydraulic hold-downs for shearing are STANDARD on Models 66K and 66KB. The adjustable stroke and high-speed greatly improves the efficiency. These models incorporate versatility, efficiency, accuracy and ease of use at an excellent price. Trilogy Machinery offers 100% factory authorized service and support from their Maryland location, as well as a full stock of OEM spare parts and accessories. The IW-50K is a compact ironworker that comes complete with a notcher. The frame recess below the punching station allows punching on the flange of large size channel or beam profiles. A great entry-level ironworker for any job shop. The IW-66K adds a hydraulic hold-down for all shearing stations. It is a great choice for those who require a fully featured machine with higher capacity yet compact in size. A popular size machine for a wide-range of metal fabricating. The IW-66KB is the latest member of the popular K-Series ironworkers by SUNRISE. 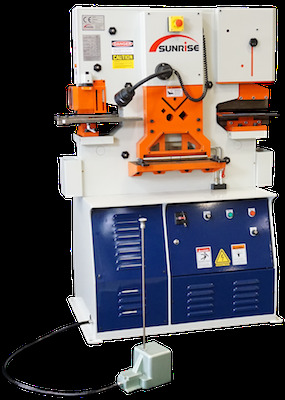 The 66KB includes an integrated 12″ press brake with full gauging system at a comfortable working height as well as a hydraulic hold-down for all shearing functions. A new leader in multi-process ironworkers. Structural Die Block for up to 1.5″ diameter hole capacity including overhang for angle. 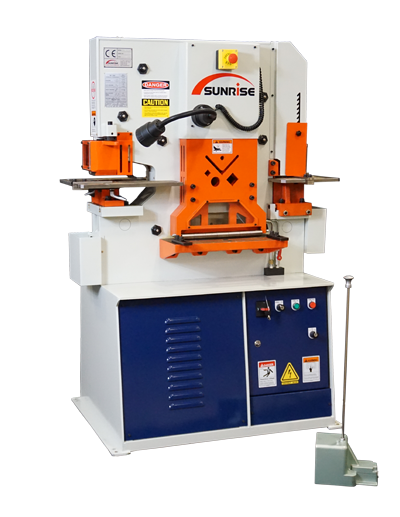 SUNRISE offers one of the widest ranges of CNC options on the market today including semi and fully automatic punches, automatic shearing and new complete processing systems.